The Cordova Museum has been associated with the nonprofit status of the Cordova Community Center which did not include the needs of the museum’s operations and funding. Now consideration is being given to allow the Museum more freedom to have its own Board of Directors and financial management. This will enable the museum to function under their own 501 (c ) (3) status allowing funding through grants and other avenues. It appears that funds will be provided to complete the book on Cordova’s oral history. This book will be used to rally support of the community through purchases that will benefit the Museum. The Museum believes that it can play a significant part in preserving the history of Cordova. Thus the mission is “To promote community bonding through an appreciation of local history.” And “To collect, preserve and present the school and town’s history and to document, preserve and share the lineage of Cordova’s early settlers and their neighbors”. A challenge of a $15,000 matching grant has been offered to the Museum if it is successful in matching this amount with its own fundraising efforts and in establishing its own 501(c)(3). Ways to reach the goal of the matching grant is a community concern as it affects us all. They need your ideas and suggestions and your willingness to get involved. 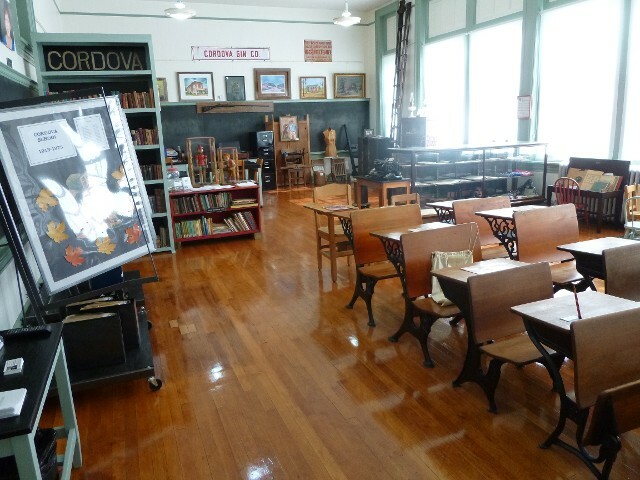 The Cordova Museum is located in the first permanent school building of the area, built in 1913 by the architectural firm of Jones and Furbringer. The school closed in 1973 and was used for storage by Shelby County for twelve years. Then in 1985 a “For Sale” sign was posted on the front lawn, and the Cordova citizens purchased the building fearing it would be torn down. They paid off the note through various fundraising events over the next five years, forming Cordova Community Center, a non-profit 501(c)(3) organization. In 1986, a museum was established in one of the old classrooms. In 2010, Darlene Sawyer, headed a team of volunteers to clean and organize the museum with intentions of opening to the public. To offset costs, she self-published a fund-raiser book and sought community support through donations and grants to cover operating expenses. When a grant was received in 2012 the museum opened.